We've talked about the Google Top Contributors a lot here, simply because I have deep respect for what they do on a day to day basis. Most SEOs who read this blog help webmasters with their SEO issues for pay - these help webmasters for free and trust me, they go through a lot to try to help these webmasters. 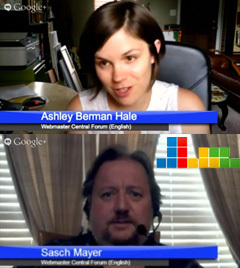 +Sasch Mayer and +Ashley Berman Hale put a video together talking about some of the challenges they face on a daily basis and then some of the tips they have to work around or overcome those challenges. Ranking algorithm is opaque and highly dynamic and the top contributors don't have all the details. They deal with very emotional webmasters and owners because they may have lost all their rankings and a lot of business. They are not at a point they want to listen. Top contributors often try simplify and demystify the algorithm. They know Google wants to rank the best web sites, the really best web sites. This webmaster forum goes beyond an online forum, they interact outside in the real world. There is a tight spirit of camaraderie that makes the place unique. We have some awesome Top Contributors in the webmasters forum - they put in a lot of time to help with websites, encouraging webmasters to make them better (and with that, perhaps gain more visibility in search). It's definitely not easy, and sometimes almost hopeless (depending on the website, the webmaster, and sometimes just how search works), but I really appreciate the help that they give there! Although I personally do not post there too often, I do read the forums every day in great detail. I see what the TCs (top contributors) go through and how helpful they can be. I also see what they put up with and the anger thrown at them by webmasters. They do this all for free but it is their community, their profession, their way of giving back to the industry. I get that - I spent a ton of time in forums helping individual members out for years. Most of my time now is spent bringing you the best forum threads here, so I can help a wider base of webmasters. But that doesn't mean I don't feel, on some level, the camaraderie felt by those TCs in the webmaster help forums. Want to become a TC, see google.com/get/topcontributor but be warned, it is not easy.